I have managed to get a little work done amidst all of the disruptions of the past couple of weeks. 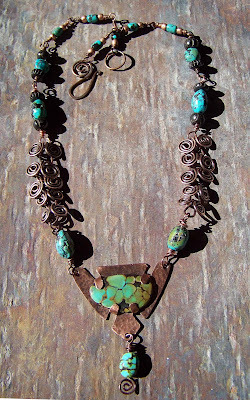 Here is a new necklace that I made using one of the turquoise cabochons that I bought at the flea market. What a beautiful necklace! I think I will try that type of setting one of these days! What a fantastic necklace, chunky and yet inticate – and I love the setting, again!